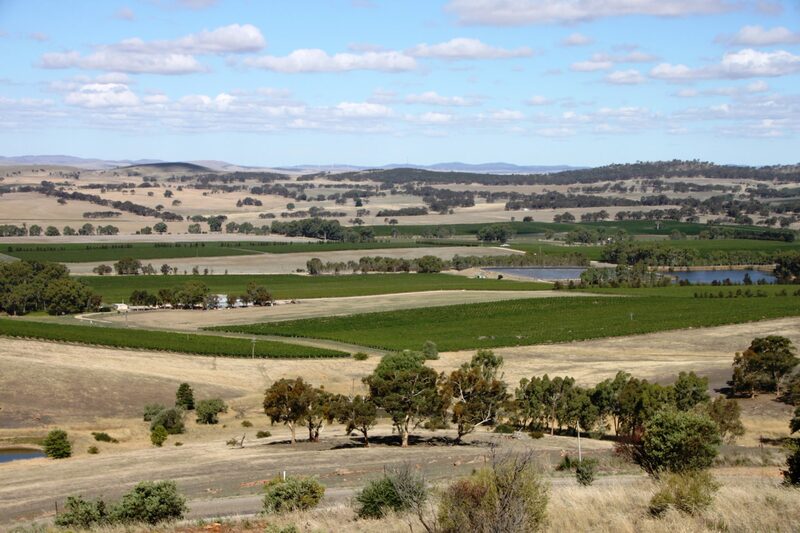 South Australia has been blessed with some excellent wine regions and the Clare Valley is definitely up there. However, wine is just the beginning of what this magnificent region has to offer. Coming from Adelaide like we did, it’ll take you less than two hours. You will feel like you’re out in the country in no time once you pass the town of Gawler. It’s here that the landscape changes to picturesque farmland where vehicle traffic can be few and far between. 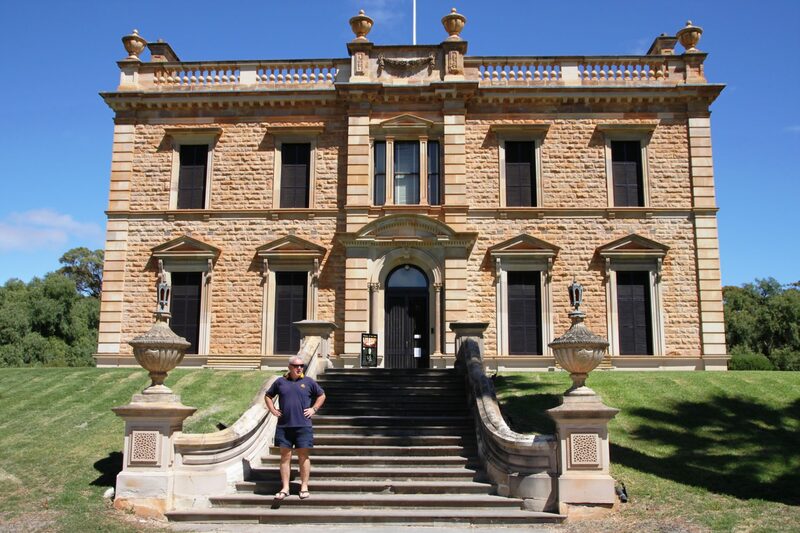 The Clare Valley is full of quaint country towns that are steeped in history. Having visited the region on several occasions previously, we chose to base ourselves at Clare’s caravan park for this visit. Nestled amongst the trees, the park is well spaced out and was surprisingly very green during our summer visit. The school holidays had recently ended so it allowed us to park comfortably without feeling we were on top of any neighbours. When travelling to a wine district, under normal circumstances you would naturally expect to be visiting the wineries. But not in Clare. Where else have you travelled to where the wineries come to visit you? During summer months at the Clare Caravan Park, local wineries are invited to showcase their wines to park visitors. On this particular day, one of the oldest in the region and a personal favourite of ours, Jim Barry Wines were going to be available for tasting. Talk about lucky. We had an absolutely blast tasting their magnificent distinctive range of wines as we shared travel stories with like-minded travellers and enjoyed the sausage sizzle that was provided by the park. Now that was a unique happy hour (more like happy hours)! 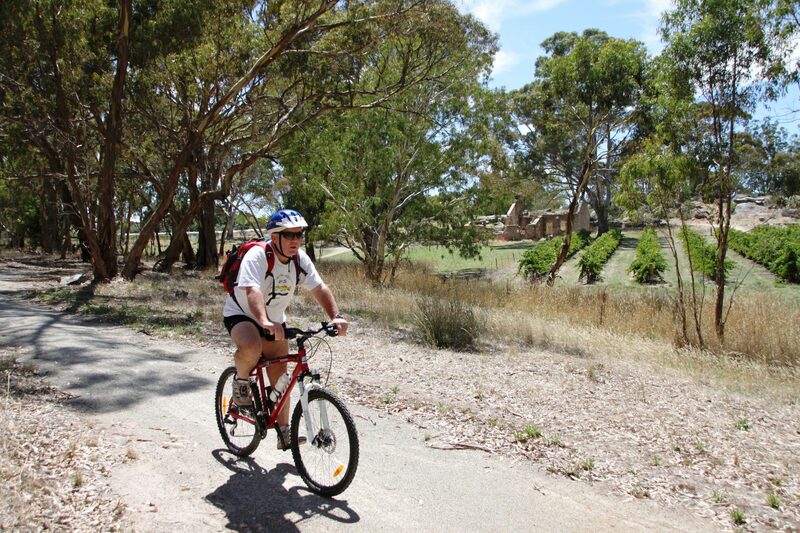 One reason for our visit to the Clare Valley was to ride some of the picturesque Riesling Trail. The 35km bicycle trail runs from Auburn in the south and ends 7km north of Clare passing through towns full of old world charm and adjacent to some award-winning wineries. The trail follows a former railway line which was completed nearly 100 years ago and finally dismantled in the late 1980s before becoming a bicycle trail some years later. Whether you’re a cycling enthusiast or not, you can ride as much or as little of the trail as you like as there are numerous entry and exit points. The trail meanders through the valley passing numerous vineyards and is often shaded by tall eucalypts. We loved stopping at the storyboards along the trail which provided loads of information about the region. If you don’t have your own bike, don’t despair, as bike hire is available in Clare. Or for a unique experience, hire one of the three or four wheel pedal go karts which two people can enjoy and are well suited for the trail. Now we couldn’t visit without at least visiting a few of the wineries. You won’t find it difficult locating cellar doors between the towns of Auburn and Clare as there are more than 40 of them along this corridor alone. World-class riesling and shiraz are highlights of the valley with Jesuit priests planting the first grapes back in 1851. Today their winery at Sevenhill is one of the oldest in the district. 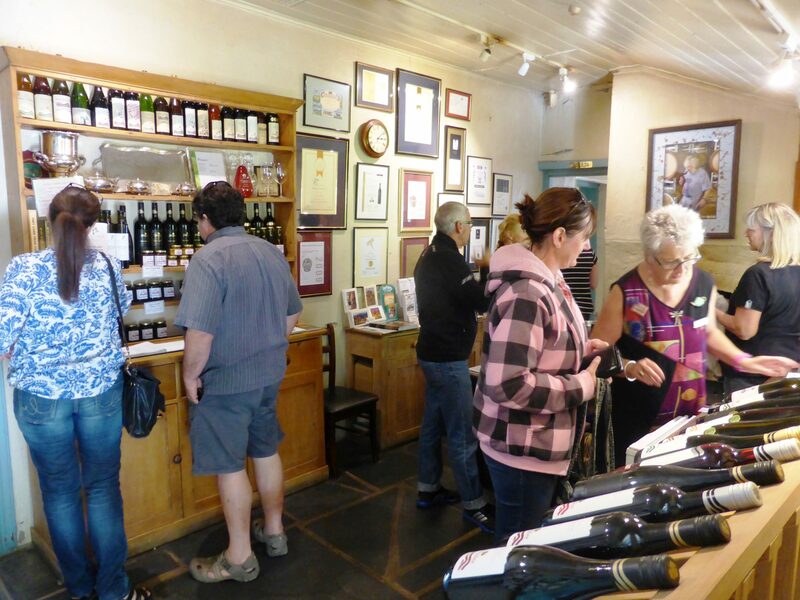 When visiting, you are treated not only to the wine, but a unique heritage experience with their underground wine cellar, wine museum and St Aloysius Church all located on site. Surrounding the cellar door are beautiful gardens, so we chose to rest our weary bike legs here with a cheese platter and a glass of their award winning riesling before continuing further. Some cellar doors have accompanying restaurants and the food can only be described as sensational. Whether you’re after a tasty platter, tapas, or gourmet style restaurant meals, you won’t go hungry in the valley, as you are spoilt for choice at local town hotels, restaurants and bistros. We were also tempted by the cafes and bakeries found in both Clare and Sevenhill with the Little Red Grape Bakery being a gem. Their sweet and savoury selection was enormous so we ended up visiting on numerous occasions. I’m not really sure we ever did enough bike riding to work off all those calories we consumed! We love attending country markets and several are held within the region each month. 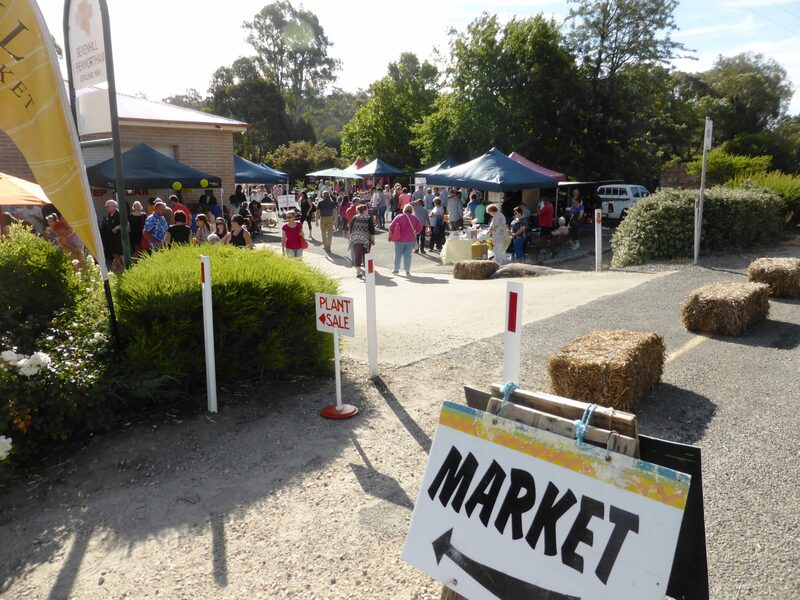 During summer, the Sevenhill twilight market is popular with both locals and visitors alike. On the night we visited, it was very busy. Stallholders were numerous with local produce, food stalls (excellent spring rolls), and entertainment all included. We managed to pick up a good selection of jams, artisan bread and some enormous free range eggs which went perfectly with our cooked breakfast the following morning. We balanced things out between bike riding and strolling through a few of the towns in the valley. Walking many of the main streets revealed a number of old buildings built during the 19th century which were still in remarkably good condition. We were particularly drawn to an early settler’s cottage at Penwortham belonging to pastoralist and explorer, John Horrocks. Built in 1839, the cottage is one of the oldest stone buildings in South Australia and today is used as a museum. Not far from Penwortham is the quaint village town of Mintaro. Home of the very impressive Martindale Hall, this Georgian style manor dates back to 1879 and dominates the landscape as you approach the homestead grounds. For the young at heart, Mintaro Maze is located only a few minutes away from Martindale Hall. Find your way through the living maze, spot some hidden treasures in the garden along the way, and then relax with a refreshment from their gift shop. To really appreciate the views of the Clare Valley, we headed up to Quarry Hill and Neagles Rock lookouts located in Clare. Although both lookouts were very windy when we visited, they provided excellent views to the valley below. For a good day trip, a visit to Burra is only 30 minutes away from Clare. When copper was discovered in 1845, a mine was established which employed nearly 1000 men. Kooringa (which later became Burra) rapidly grew as a result of what was called the “Monster Mine” to become Australia’s largest inland town by 1851. Whilst mining ceased years ago, the town today has a magnificent heritage trail. To take advantage of everything to see and do around the district, we purchased a Burra Heritage Passport from the local visitor centre. The passport system is a fantastic way to see the town and its surrounds as it comprises a key and guide book which provides access to no less than eleven historic sites. With map and key in hand, we found the trail to be excellent, as we could visit the local attractions at our own pace and in the comfort of our own vehicle. 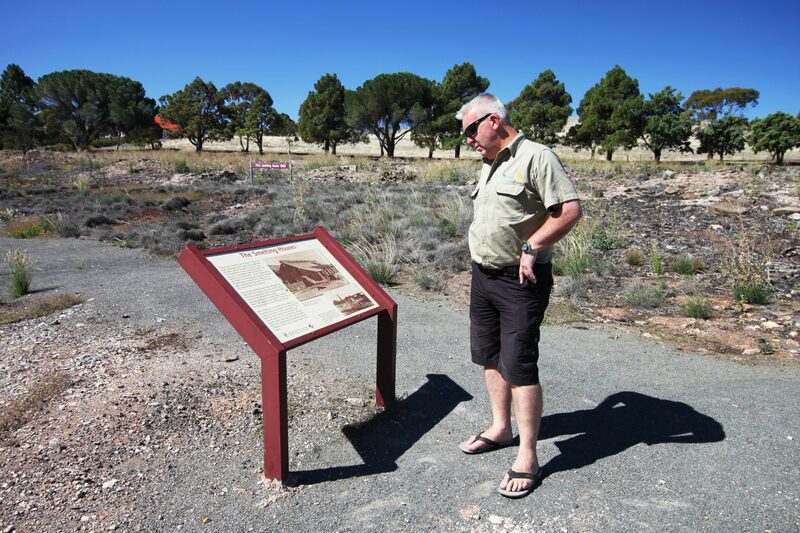 A variety of historic sites are covered along the trail including Reduth Gaol, Burra Smelter, Unicorn Brewery Cellars and multiple museums. It’s a full day affair, plus some! One attraction on the historic trail was a visit to the miners’ dugouts. With the rapid development of the town in 1851, there was a significant shortage of housing for the miners and their families. It’s hard to imagine that nearly 2000 people lived in dugouts along the town’s creek living in insanitary conditions for nearly 10 years. Today there are only a few of the dugouts remaining which are quite fragile. If you’re looking for somewhere different for your next trip which has towns steeped with history, magnificent wineries, and loads of attractions, the Clare Valley is waiting for you.